Boy Obama is really embracing socialism, isn't he?. I think that sign is kinda clever and funny. 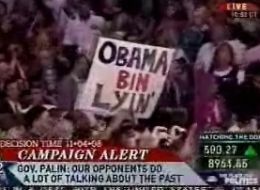 So it sounds like Osama Bin Laden, which is almost a household name. Why aren't you talking about the people shouting cut his head off or kill him at one of McCain's recent stops? Isn't that a lot more inflammatory? This is quite possibly one of the best web games I have ever played. Wow Joel I am honestly shocked by your "kinda clever and funny" comment. And by making fun of his name I dont think he implied this sort of concept. I'm just being honest. I'm not saying I would be dumb enough to hold a sign like that. In a day and age where it's acceptable for people to call the president a Nazi and wish the Vice President died and joke about him shooting someone in the face, I think that this isn't that big of a deal. People say dumb crap. People hold dumb signs. I'm more worried about the story where a public school teacher took her class to a field trip to watch her marry her lesbian lover. I don't know all the details, but that sounds insane.